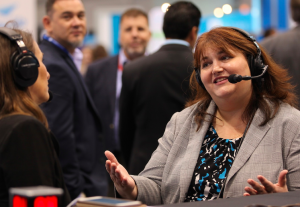 Jay Kuhns and Rayanne Thorn talk about the upcoming ASHHRA Conference for #HealthcareHR – how to get the most out of attending. Jay Kuhns, SPHR, is the VP of Operations & Healthcare Strategy at Kinetix and has presented and keynoted at many industry conferences. In this special edition of HR Latte, Jay and Rayanne talk about the upcoming ASHHRA Conference SEP 24-27 in Grapevine, TX and how attendees and vendors can best benefit from attending. Join us for a quick conversation about the value of conference attendance, what your expectations should be, how to benefit from sessions and presentations, and so much more! If you will be at the Annual ASHHRA Conference, make sure to come by the Dovetail Booth and say, “Hi!”- we’ll be in Booth #130; we’d love to meet you and talk about what you have going on. ** Check out the Kinetix podcast, Talent Sniper Radio for all kinds of great HR-related information. Dovetail Software delivers SaaS solutions & help desk programs to reduce administrative & support costs, diagnose & resolve complex business problems, and increase efficiency, while improving support.